New Member for the Alé - Cipollini Team, that signs the strong South Korean rider, Champion of Asia 2018 and National Gold Medal in the Road Race and in the Individual Time Trial. Born in 1990, Na Ahreum raced with the South Korean National Team at the Olympic Games in London 2012 finishing the Road Race in 13th place. She won in the same year the ITT Race at the Nationals, repeating the win in 2015; She won her first Continental title in 2016 in Oshima (Japan) before winning the road race in the Nationals in 2017. Last year Na Ahreum took the gold medal in both races at the Championships of South Korea and in the Road Race of the Asian Championships, which took place in Indonesia. She also ended the Chinese races Tour of Zhoushand Island II as 2nd and the Tour of Zhoushan Island I as 5th in 2012. The Team Manager Fortunato Lacquaniti says: Na Ahreum is strong and she has big potentialities, then she is already selected for the Olympics of Tokyo 2020. For Alé - Cipollini and its sponsor is a big step forward to Asia”. 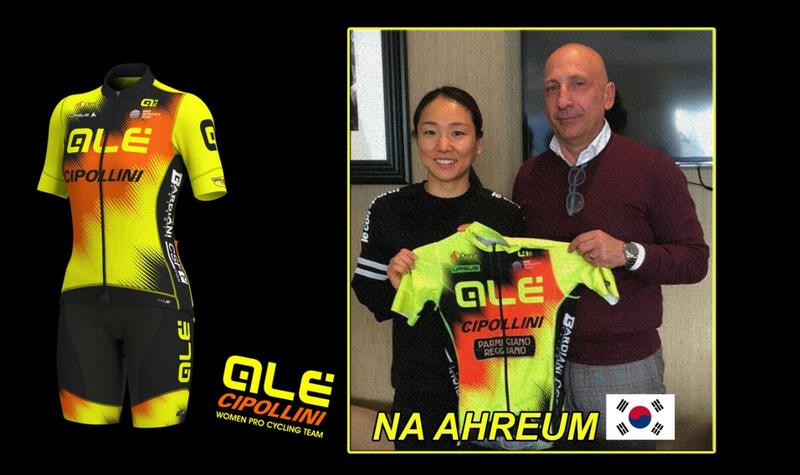 Na Ahreum is the second Asian cyclist in the Alé - Cipollini 2019 roster, after the sign of the Japanese Champion Eri Yonamine.